The aim of this chapter is to showcase the potential of new, Cloud-based, Information and Communication Technology (ICT) platforms for transport logistics chain management. The related literature is analysed from five perspectives. First, by examining supply chain issues relating to integration of core processes across organizational boundaries, through improved communication, partnerships, and cooperation. Second, from a strategy and planning perspective, by examining supply chain management as an IT platform dependent business practice. Third, by considering implementation issues using agent, as well as Web service technologies. Fourth, by considering the impact of new trends in service computing built around technologies, such as Semantic Web services and Service Oriented Architecture (SOA), on transport logistics. Finally, the chapter proposes a Cloud-based SOA software platform as an enabler for lowering transaction costs and enhancing business opportunities through service virtualization in shipping transport logistics. The operational aspects of shipping transport logistics management are illustrated using a business case that shows the opportunities for increased collaboration through Cloud-based virtualized services. This chapter explains why Cloud computing creates many opportunities and value-enhancing capabilities for supply chain logistics organisations. In particular, this chapter proposes a systematic approach for identifying and modelling services in shipping transport logistics and provides examples of how such services can execute in a Cloud-based infrastructure. In general, a logistics chain can be considered to constitute five interdependent types of actors: suppliers, manufacturers, distributors, retailers, and customers. The actors and their objectives are illustrated in Figure 1. Suppliers are responsible for supplying resources to this chain of activities. The strategic procurement decisions at corporate and functional level include supplier evaluation, optimal use of the supplier base through the management of supplier relationships, purchase order processing, buying, and payment, as well as the management of quality control processes. The role of manufacturers is the transformation of raw materials into finished goods. Modern manufacturing includes all intermediate processes required for the production and integration of a product's components. Some of the important activities in manufacturing include forecasting, engineering, service level optimization, replenishment planning, inventory deployment, and quality control processes (Chopra & Meindl, 2012; Lysons & Gillingham, 2003; Mathe & Shapiro, 1993). The responsibilities of distributors are to minimize the cost of labour, space and equipment in the warehouse, while meeting deadlines. The responsibilities of distributors include receiving, putting away, storing, picking, and shipping the goods. A retailer purchases goods or products in large quantities from manufacturers or through wholesalers, and then sells them on to consumers. Retailing can be done in either physical locations or online. Retailing includes subordinate services, such as delivery. Developing and maintaining a customer service policy is an important aspect of these interconnected activities. In addition, the supply logistics chain includes a communications infrastructure. In order to achieve collaboration, organisations need to orchestrate supply chain operations with external partners—beyond the corporate boundaries. A supply chain can be therefore, viewed also as an extended enterprise beginning with the final customer and ending with the suppliers. This concept implies a mutual dependency between the actors based on shared responsibility to pool core competencies and to utilise business knowledge from each network participant. 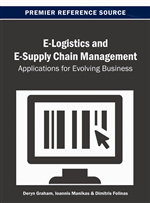 This chapter argues that visibility of the provided supply chain services is a critical prerequisite for such collaboration. The chapter therefore introduces a systematic approach for identifying and modeling such services, using shipping transport logistics as a case study. Finally, it argues that for effective orchestration and coordination, services need to be virtualised as parts of a Cloud approach. The remaining of the chapter is structured as follows. Section 2 presents the main organisation, business and process requirements for collaboration in transport logistics, and a survey of technologies for process integration such as software agents, web services and semantic web services. Section 3 introduces a software platform that virtualises shipping transport logistic services by migrating them to the cloud. The use of this platform for the discovery and modelling of services in service transport domain is explained by an example in Section 5. Finally, the chapter concludes with the future directions for research and with a set of recommendations on how transportation chains can coordinate to deliver values to their stakeholders.